A carrotini, hoomin, he needs a carrotini. Better make it double. PS: A little bit about Dublin and Chessie. NOTES: These are two of the most underrated rabbits at BHRR! Chessie and Dublin are deeply devoted brothers who lost their sister, Leelu, about two years ago. 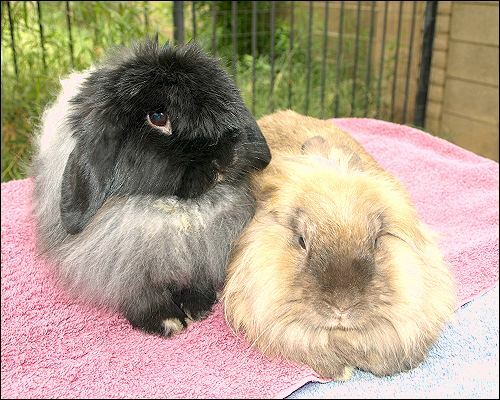 Since her passing they have grown even closer and are some of the funniest, happiest and engaging buns you can imagine. Dublin is a binky-king and Chessie is his comic relief. They are separable and truly never out of each other’s sight. They have been adopted a few times but due to unfortunate circumstances with those families, Chessie and Dublin were returned to BHRR. We are searching high and low for their PERFECT family….the one that will open their home and their hearts to these incredible buns forever. If any two bunnies deserve to win the adoption lottery, it’s Chessie and Dublin. These two-fer deals can't last folks. Get this fine fuzzy pair before it is too late!! !